Over the past few months of being on the Keto Diet, I realized that the one of the textures that I miss most is crispiness. The Keto Cheese Crisps are the perfect solution to my crispiness cravings. There are a few cheese crips on the market where you don’t have to cook them yourself, I decided to give it a try and realized it is so easy to make your own low carb chips. If you don’t feel like making this recipe, I totally get it, we are all super busy. Here are some of my favorite cheese crisp choices that you can order on Amazon. They come in several varieties like Aged Cheddar, Jalapeno, Grilled Cheese, and Mild Cheddar in bar form so that your are eating a cheese crisp the size of a granola bar. I usually break it up so you can use it to scoop your dip or dressing. Order them from Amazon here and learn more about them too. I discovered Just the Cheese in my low carb subscription box, Sweet Treat. Find our favorite Subscription Boxes here. These cute minis from Just the Cheese are a fun choice for dipping. These high protein snacks are low carb, gluten free and made with 100% Natural Cheese from Wisconsin. The flavors are Garlic & Chive, White Cheddar, Grilled Cheese, Jalapeno, and Wisconsin Cheddar. You can easily keep a package in your purse for those times where you are hungry and cannot just order a low carb lunch or snack. Learn more about them here. The other choice of cheese crisps that I have tried and loved are Cello Whisps. They are extremely crunchy and delicious. Also, the are available at Costco! They are on every order that I get from Instacart from Costco! OMG YUM and so easy to order. Also, Cello Cheese Whisps have a large variety of flavors available on Amazon like Parmesan Cheese, Asiago & Pepper Jack (I need to try this one! ), and Cheddar Cheese Crisps. See all the options here on Amazon. 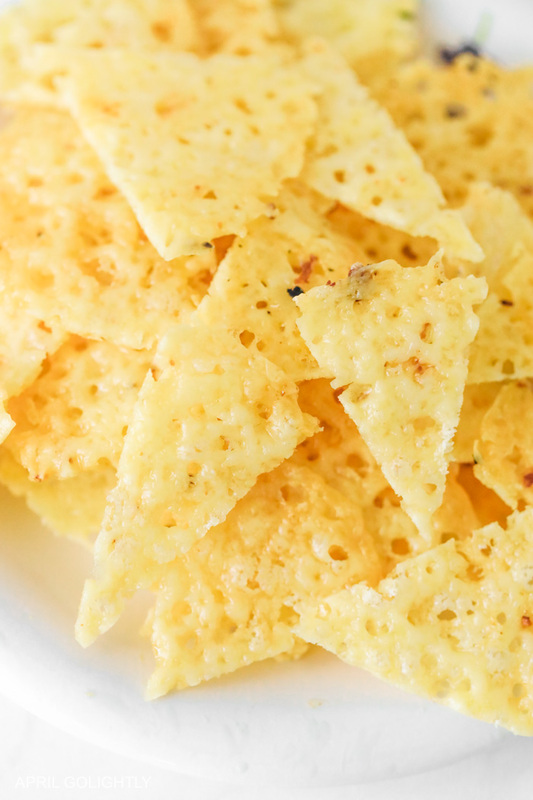 Why Cheese Crisps are Awesome? Cheese crisps are awesome because they are high in protein and low in carbohydrates making them an ideal choice for anyone on low carb diet like the Keto Diet. Of course, they are not only for Keto Dieters, who doesn’t love cheese? I would rather eat crispy cheese than a chocolate bar any day. How to Make Cheese Crisps? Start by grating your cheese of choice. You can buy grated cheese too, but the most cost effective way of making cheese crisps requires that you grate your own cheese. When you make your own cheese chips, you can make any cheese variation you want. This is especially awesome for cheese lovers, with amazing cheese taste. The easiest cheese crisp to start making on your own are parmesan cheese crisps because parm cheese grates very well. For your first time making cheese chips, you can also mix parmesan with another of your favorite cheeses. Grate everything from cheddar to asiago. Today, I went with gouda and parmesan cheese. Grate about the same amount of each cheese and mix together in a bowl. Take a tablespoon of the cheese mixture and place on a parchment lined cookie sheet. Please down the cheese. Give about 1/2 inch spacing between each cheese pancake. With your fingers, flatten each mound of cheese. Bake the cheese for for 10 minutes at 375 degrees F until edges are browned and cheese is sizzling. Allow the crisps to cool for 10 minutes or more. Cut the cheese with kitchen sheers into triangles like a pizza. Part of getting to eat something crispy on the Keto diet is being able to scoop things like low carb dips and dressings. Dips are no fun if you can’t scoop them up and crunch a nice chip with them! Here are some of my favorite low carb dips to go with your low carb cheese chips. This is definitely not a dip, but I love my cheese crisps with over easy eggs in the morning. I always dipped bread into the yellow egg yolks since I was a child. I really miss eating just the yolks and these cheese chips are the way to scoop without bread! Grate the cheese into a large bow and mix. Try these amazing Keto Jalapeno Poppers from Live Love Texas. Make this delicious Keto Cheese Pizza for your next dinner. The perfect lunch when you are on the Keto diet starts with this easy to make Keto Egg Drop Soup. Feeling indulgent, but want to stay within your limits on Keto, try this Keto Hot Chocolate or a Keto Chocolate Fat Bombs. Am I missing something? I don’t see an oven temperature or a bake time? Thanks for the heads up – my recipe plugin is acting weird – The temp is 375 Degress for 10 minutes. Thanks. Way too many commercials before the recipe is ever found and the video is stuck in an ad mode loop. I won’t be opening any more of these. I have been making these non-stop. SOOO yummy!